Humanized Mouse Lipoprotein Profiling | Yecuris FRG: humanized animals and human hepatocytes platform for your next great discovery. 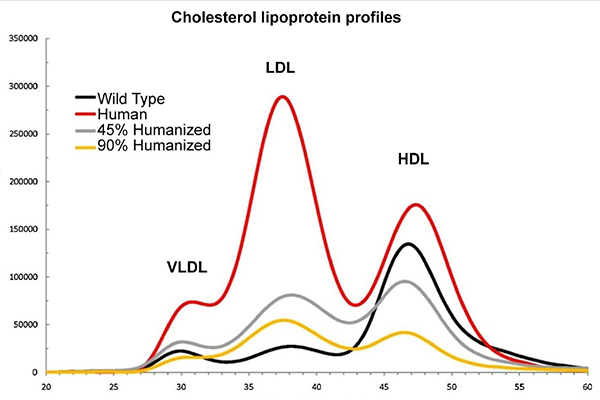 Ellis EC, Naugler S, Parini P, Mörk LM, Jorns C, Zemack H, Sandblom AL, Björkhem I, Ericzon BG, Wilson EM, Strom SC, Grompe M.
Chimeric mice displayed increased LDL and VLDL fractions and a lower HDL fraction compared to wild type, thus significantly shifting the ratio of LDL/HDL towards a human profile. Bile acid analysis revealed a human-like pattern with high amounts of cholic acid and deoxycholic acid (DCA). Control mice had only taurine-conjugated bile acids as expcted, but highly repopulated mice had glycine-conjugated cholic acid as found in human bile. RNA levels of human genes involved in bile acid synthesis including CYP7A1, and CYP27A1 were significantly upregulated as compared to human control liver. However, administration of recombinant hFGF19 restored human CYP7A1 levels to normal.